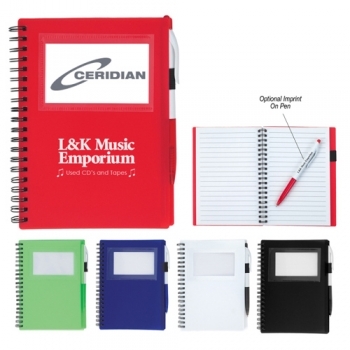 Promotional spiral notebook with ID window adds conviction to your business and buys customer favoritism. This spiral notebook makes a great corporate gift, encouragement token, acknowledgement gift and many more. Logoed promotional spiral notebook with ID window can be gifted during promotional events such as tradeshows, corporate meetings, symposiums, exhibitions, etc. This spiral notebook with ID window can be considered for bulk gifting and discounts can be availed. Request for quote to know more about value pricing. Features – 70 page lined notebook, matching pen in elastic pen loop. Colors available – Lime Green, Black, Red, White or Blue. Imprint Area - Notebook: 3" W x 3" H • Optional On Pen: 1 ½" W x 3 ⁄8" H - Add .25(G) per piece. Available Colors: Black, Red, Lime Green, White or Blue.